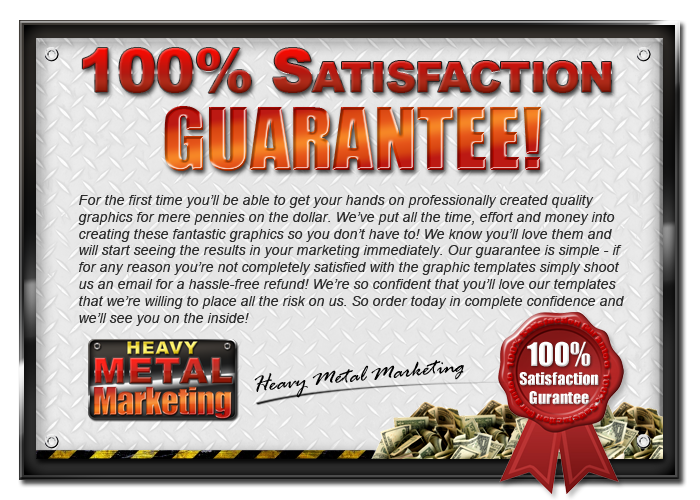 ﻿ Heavy Metal Marketing - Quality Guru-Style Minisite Templates! MUST SEE! From The Desk Of Anders Eriksson. When it comes to marketing your products online, nothing is worse than attempting to do everything yourself – and I mean EVERYTHING! It’s bad enough just putting an eBook together and writing up a sales page. It’s bad enough just setting up your site with your own PayPal button and getting that linked to your download page! Well, whilst I can’t promise an easy solution to have everything done for you, I can provide you with the graphics already done to make your life easier! Unless you’ve been hiding under a rock or are completely new to the internet, you’ll know that graphics help SELL a product. I don’t care what you’re selling – words alone can only do so much, but graphics will help your visitors decide if they want to stay on your website and read your sales copy or leave there and then. Good graphics represent you, your business and what you’re selling. If your site looks tacky, and looks like a home-improvement botched job, what impression does that leave about your product? It doesn’t matter how good your sales copy is, how valuable your product actually is, or what other people are saying through your testimonials, or even if you’re offering a LIFETIME guarantee. No one would care and your efforts would be completely wasted! Forget about one-time offers, upsells, downsells and cross-sells, tell-a-friend scripts, tweet me buttons, share this on Facebook buttons, affiliate programs or even offering high-ticket items, none of it will happen because you didn’t make a good first and lasting impression. You did not WOW them! Even if you wanted to collect sign-ups and follow up with your subscribers with promo emails for you products and affiliate recommendations, no one would want to sign-up because of the first impression you’re leaving on your site! They’ll remember you as ‘that’s the guy with that awful website trying to spam me and sell me junk’... harsh but true. So with that said, it stands to reason that graphics comes FIRST in the sales process and is definitely a top priority when it comes to building an online presence. Post a job on Elance or similar site and hire someone else to do it for you? – It’s a very sensible choice seeing as there are many professionals on there that can provide you with decent mini-site graphics. However there are NO guarantees when you hire someone to do the work for you especially if you haven’t seen their work before. I’ve had many bad experiences with so-called graphics designers who did the work but didn’t put in ANY effort, care or attention to detail into the design and left me with digital junk! On the other hand, I’ve had AMAZING graphics created for me but nearly had a heart attack at the price - $600! Sure the design was great, and would certainly do the job but it was simply un-affordable and difficult to recoup my investment quickly enough to hire any time soon! Watch a load of Photoshop tutorials on YouTube and try doing it yourself? – Now I’m not doubting your skills, but learning to use Photoshop does take time. I’ve used it for several years now and still don’t know all the functions! And once you’ve mastered the main functions you’ll still need to learn how to compose and arrange your graphics so it’ll look good in a smaller resolution and in 3D. I’ve created 100s of mini-sites over the span of my time online. So much so, that it’s become second nature to me. What does that mean for you?... 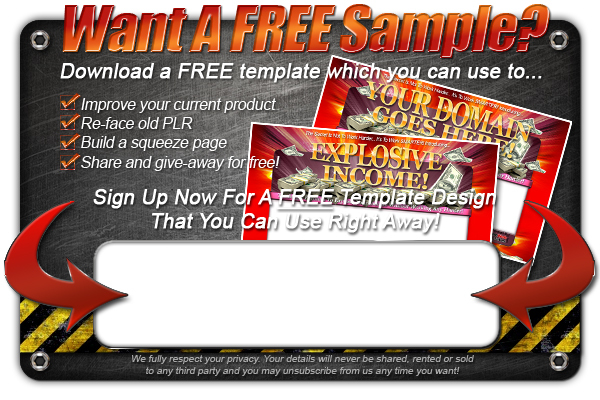 It simply means I can create more templates, faster, better and cheaper for you! It also means you can start putting your products online quickly, without fuss about what to do about those graphics and then reaping the benefits of more leads, sales and higher conversions! So what I’ve done for you is create 7 complete mini-site graphic packages which you can modify with your product or business name. You’ll also receive the FLATTENED PSDs and fonts that will allow you to add your own product name or domain name onto the templates. This soft-blue template will make an ideal squeeze page and report that informs the user on how to make money using a single technique. It will also make a great template for a low-cost $7 report. The soft blue and green theme make it completely inviting and friendly and will have many people gathering round your site! Viral Marketing is a subject onto itself that has proven to be very popular over the years. This metal theme, similar to the theme of this site you're on now, has a great WOW factor to it and will stop visitors in their tracks. Due to the more expensive feel to this site, you will do well using this graphic set to sell your own product. No matter how many solutions, ways and methods to making money online, there will always be people, especially newbies who will be 'lost' by information overload. As the theme implies, it was designed to clear the air and help people find their way online. Great for handing out a free report in exchange for a name and email, and also great as an affiliate landing page to promote other people's products! Marketing involved more than just putting together website and selling a product. Most of the work will stem from research and marketing. 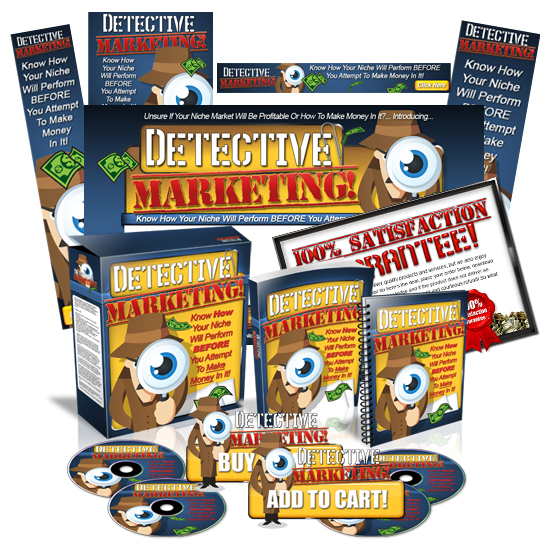 This theme will pair up great with a product on keyword research, niche marketing, forum marketing, or for a piece of software that digs into niches for you and spy on competition! This agressive marketing template will make a great platform to sell your own 'underground' type eBook or video tutorials. Due to it's darkness and mysterious feel, it will perform well in squeeze pages and make for a great viral marketing site that displays one-time offers! One of the major search terms typed into the search engines, this cartoon themed 'Work From Home' template will make a great introductary product or free report to making money in the online world. Use it to promote an 'online survey product', a 'freelancing guide', a 'bum marketing' guide, an 'affiliate marketing' guide and so on. Similar to the previous template except more serious, this 'Make Money Online' template will make for a great entry level product. If you already own a PLR product with a specific guide to making money online with article marketing, affiliate marketing, product creation, list building or so on, this template will act as your sales person! As you can see from the templates above, we really do spend a lot of time crafting each and every one of these templates. These ARE NOT cheesy mashed-together templates that were designed for a quick profit. They were designed to the same standard that we'd use for our own products! "This Is TRULE A Money Saver!" I simply loved Heavy Metal Marketing! Seriously, this product was an absolute necessity for me after I had looked at my monthly Elance expense report! I simply couldn’t afford to keep paying designers (even if they were reasonably priced) for the enormous amount of graphics I needed for my sites. I simply had to find a better way to create great looking graphics without incurring the great expense. I mean, a small “Buy Now” button cost me $15. Not much, but when you add other graphics such as “Contact Me” or “Add To Cart” or “Promo Code” or “Check Out,” you begin to see how $15 here and $25 there all add up! Any decent page could have up two 15 graphics on it – usually more! How much money is that? With Heavy Metal Marketing I am saving tons of money. I made up the price alone by simply adding two of the graphics to my site in the first five minutes! This is truly a money saver that will continue to save me cash as long as you will find me online! Thank you! "The Graphics And Files Were All Excellent, High Quality, And Contemporary..."
You've saved me the two things I need the most in life – time and money. After buying the product, I didn’t have to spend money to pay someone to create the graphics I needed for my company’s two websites. The library of graphics will also allow me to mix and match perfectly as we move forward with new and fresh content and photos. After purchasing your product I was immediately able to download the necessary files and basically drop them into my website with absolutely no problems at all! It was perfect, actually. My company is launching a new product line soon, which will be marketed to an entirely different type of consumer and I will also employ these graphics to the new site – saving me even more money! I couldn’t be happier! The graphics and files were all excellent, high quality, and contemporary, giving our websites that very clean and professional look that exudes confidence in our products. Thank you. "The Graphics Worked Perfectly!... It Did Such An Amazing Job!" Seriously your graphics are so easy to use and had provided me so many extra graphics that I was able to start up a couple of new websites for my own products translating to increased sales! In fact, I had a few domain names sitting around doing nothing because I didn’t have much cash to get the sites up and going. But, then I purchased your graphics to clean up my current website and thought I could use it for the other domains I had. The graphics worked perfectly! It did such an amazing job and saved me tons of money that I am now using those previously dormant sites to make extra sales! Thank you! The easy to use format, with rich, high quality graphics is exactly what I needed to bring my websites into the 21st century! Thank you for putting out such a high quality product that I will be able use again and again! Whilst we place a lot of emphasis on designing jaw-dropping graphics, there are other factors such as web site design, ease of use, and SEO to consider to ensure that now only you think your site looks great, but your visitors and the search engines do too! 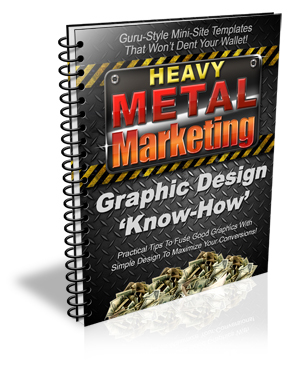 When you invest in our Heavy Metal Marketing package, we'll also equip you with our 60-page report on 'Graphic Design Know-How' absolutely free! 5 Simple Yet Important Rules in Website Design - it's not as obvious as you might think as too many marketers try to over complicate the process! 5 Ways to Keep Visitors Coming Back For More - getting traffic is hard enough as it is, but getting them to come back to your site is even harder. How To Have Websites Built For You The Cheap Way - building sites from scratch takes time. Time that could otherwise be spent making money and growing your business! Read this section to see how you can outsource this task whilst keeping your costs down. The Importance of a Sitemap and How To Create One - doing this lets the search engines know exactly what content in available in your site and dramatically improves your site's visibility. How to Improve Usability of Your Website - The easier you make your website to use, the more comfortable your visitors will feel on your site, which keeps them on your site for longer. Longer browsing in most cases leads to higher conversions! Make It Easy To Buy From Your Site - No matter what type of site you're designing, there's nothing worse than not knowing how to buy a product especially if the button is hidden someone on your page, not obviously placed! Ensure your visitors know exactly where to click so you can close the sale! How to Reducing Load Time Through Image Optimization - Sometimes it's worth sacrificing image quality for website speed. Read this section to find out how to reduce your loading times and keep your visitors happy! How to Find Out Who Your Audience REALLY Is And Why? - By knowing EXACTLY who your visitors are and by understanding their problems, you'll be in a much better position to design your website 'in-sync' with their mindset. This is a huge conversion plus! This special guide is packed full of practical useful content that you'll want to bare in mind when creating your own websites. Whilst we had intentions to sell this as a stand-alone product, we decided to give you it completely free as our way of saying thank you for investing in our graphics! You can re-face your existing product that’s not selling so well! – You may already have your own product that’s running live on your server right now. Problem is, is it really pulling in the sales like you hoped? If not, it may very well be down to your presentation! By simply rebranding one of the graphics packages to match your product name, you’ll instantly have a new site that you can be proud to promote! You can re-face your old PLR product! – PLR is useless just sitting on your hard drive. You may have it set aside in a ‘to work on later’ folder but the fact is you’re put off from the amount of work you’d have to go through into order to bring it to life! 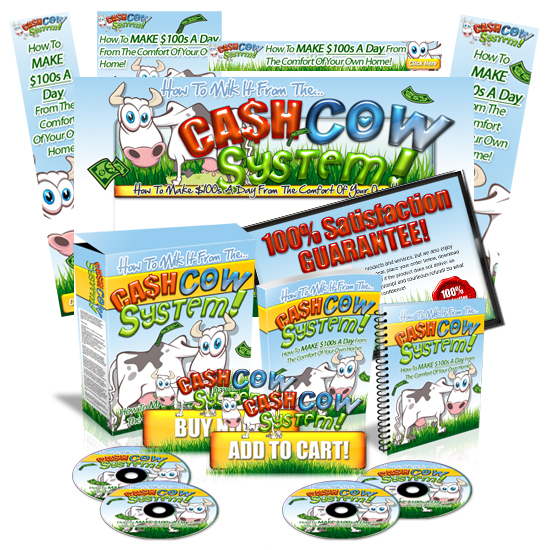 Simply choose a graphic set and rebrand with your new product name and you’ll finally have your new PLR product that you invested in making money for you, rather than costing you! You can create a new squeeze page to collect leads! – Building squeeze pages from scratch does take a toll on your time. What better way to get yours up and running by using a template that’s already been made for you so you only have to concentrate on the mechanics of your site! You can create a review-style website that promotes other people’s products! – Review sites or pre-sell templates as they’re also known, are usually very plain and boring. It doesn’t have to be that way. Why not stand out from the affiliate crowd and make a statement with these graphic templates! You can create an graphic store and sell them individually! – If you don’t like the idea of using these graphics for your own use, then why not sell them? If you purchase the Master Resell Rights license, you’ll be able create a new e-store dedicated to just providing graphics for internet marketers! You can sell them as they are! – Want to make your money back many times over? Now you can sell the entire graphics package exactly as they are without any modification or needing to set up your own site! If you opt for the Master Resell Rights license you’ll get all the tools you need to start selling valuable in-demand graphics that marketers and webmasters NEED! You can use them as membership content to keep your members happy! – If you already own a membership site, you can add these graphics into your members area and keep your customers very happy! Even if you haven’t got a membership site yet, these graphic packages will form a great basis for you to start with! These are just a few ideas off the top of my head but you get the idea. These website graphics have so many uses and value in themselves that it will cost you NOT to have them! As always, there are rules and limitations when it comes to buying products online and these graphics are no exception. For a limited time, you’ll instantly be upgraded to a Master Resell Rights license with your purchase which will allow you to make money from as many angles as possible! As I said before, these templates are so versatile and reach out to a variety of sub-niches and cater to different people that you’ll be able to start making money with them in no time! And with your Master Resell Rights license and reseller’s kit you’ll be able to recoup your investment several times over no sweat! Lower Conversions – the lower your conversions are, the harder it is for you to make sales or to capture a lead. A switch with these graphics will instantly reduce the time, effort and money needed to convert your visitors! Useless Domain Names – If you’ve put up a website before and got into a routine of doing so, I’m sure you’ll have domain names lying around that need filling up with a website? You can finally make use of that wasted $10 and earn your hard earn money back with a new product up and running on your new site! 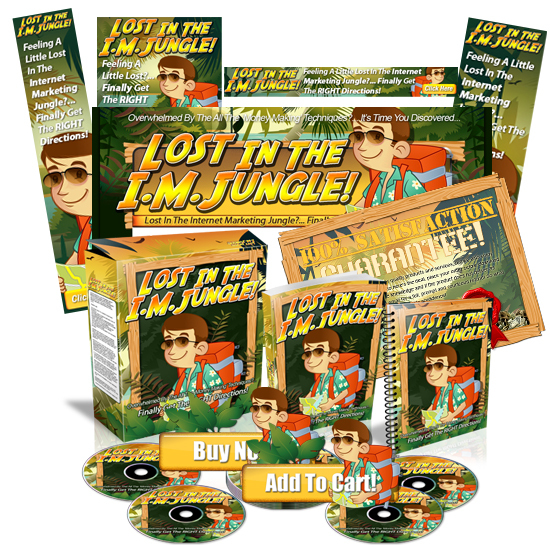 Wasted PLR Material – how many times have you bought PLR products but done NOTHING with them? Maybe the content was good, but the sales page and presentation was lacking which stopped you from going any further. Now you can put that PLR to good use and match it up with one of our templates! Less Subscribers and Withered Sign-Ups – How much is it costing you to have your sign-up rates crippled due to a poor mini-site design? Imagine what would happen if your opt-in rate doubled tomorrow because of a simple graphic improvement! How much difference would it make to you? Wasted Auto-Responder Series – Those beautifully crafted emails that you spent hours writing up to promote your own products and affiliate recommendations are not showing their true potential and not earning you the money you expected. And let’s not forget that it’s costing monthly to have an auto-responder system! Just a change in your mini-site graphics would lead to more sign-ups and more people reading your emails and buying your offers! Wasted Market Research! – How much time have you wasted doing keyword research and optimizing your website for that one keyword or keyphrase – not to mention the so-called investment on the software to help do that for you?! You may already be getting the right kind of traffic but nothing converting because of your shoddy mini-site design. Less Sales! – With a lower conversion rate you can expect less sales and a direct impact to how much you’ll earn online. All it can take is a graphical make-over to ensure your success! I could go on and on about how graphics can affect your online presence and your long-term success, as well as other factors like your affiliate program and viral marketing campaigns but I think you are starting to see the bigger picture now. So now it’s time for you to make a decision. Are you going to continue struggling and getting by with what you’re currently earning online and making do with those cheesy graphics that came pre-packed with your PLR, or are you going to take action today and leverage of the time and effort – and money off someone else! Here on this site are the graphics needed to give you a dramatic boost in your online presence! They will grab the attention of anyone who comes to your site, whether it’s for a sign-up, to purchase or even to recommend other products. They will stop and take a look, and give your sales copy a chance! And then, they’ll finally click that subscribe button, that order button or your affiliate link and you’ll stand a much better chance of making the sale! I will not bore you with a price list of how much it costs to create these graphics, but let me tell you now, it wasn’t cheap and it took many man hours to create. So before you scroll down to peak at the price, just remember that it costs $600 upwards for a ‘decent’ graphic set. And just before you any further, please rest assured that you are backed by a completely risk-free guarantee!.. Simply place your order below and you’ll be forwarded to the download page where you’ll get access to all 7 one-of-a-kind graphics templates that will result in more leads, more sales, more affiliates and more traffic! YES! 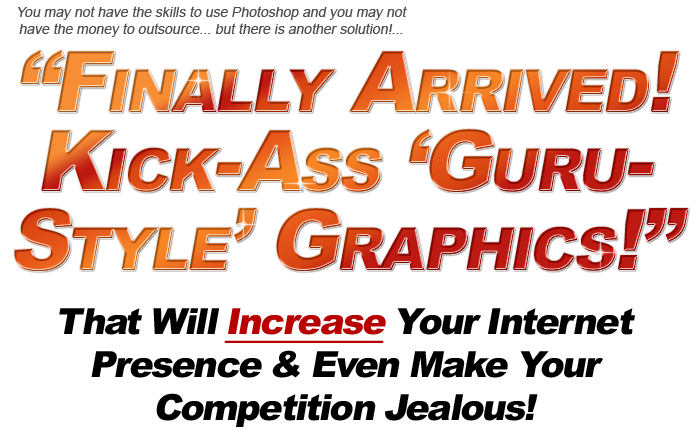 I understand that I will be getting access to the 'Heavy Metal Marketing' graphics package straight after payment! YES! I also understand that for a limited time only, these templates come with Master Resell Rights with all the sales material which means I can use them myself and sell them on to other marketers for 100% profit! YES! I also understand I'm completely backed by a 60-day guarantee! If I'm seriously not happy with the graphics, I can simply ask for a full and prompt refund! BEST PRICE!! $9.24 /w Master Resell Rights! Please note: You will be automatically redirected to the download page after checkout. redirect you to continue and get instant access to your product. If you do not have a support desk yet click here to get your own!! P.S. You’ll be able to pick up Master Resell Rights to this entire package! Even if you don’t have any use for these graphics, someone else will and that’s money in your account! Disclaimer - ClickBank is a registered trademark of Keynetics Inc., a Delaware corporation. 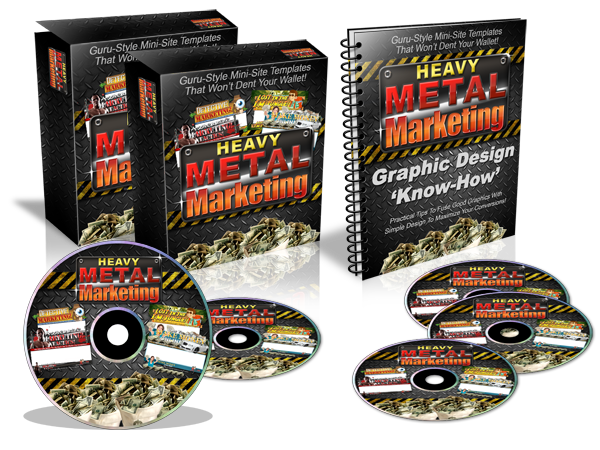 Heavy Metal Marketing is not affiliated with Keynetics Inc. in any way, nor does Keynetics Inc. sponsor or approve any Heavy Metal Marketing product. Keynetics Inc. expresses no opinion as to the correctness of any of the statements made by Heavy Metal Marketing in the materials on this Web page. Heavy Metal Marketing. All Rights Reserved.